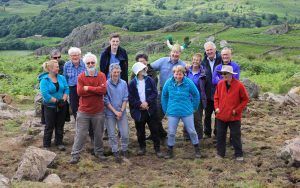 For two weeks each year for three years the sound of an army of volunteer diggers echoed the glorious Seathwaite valley. Three structures were to be excavated to investigate their construction, purpose and age. We were hoping they might be Norse! 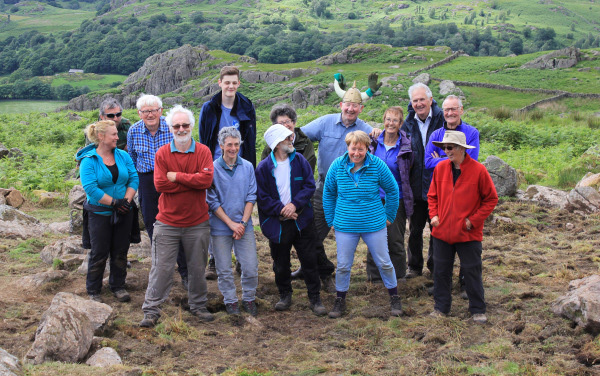 Each day around twelve volunteers assembled early at Seathwaite Parish Room for an update from Jeremy, before setting off to the designated site. Jeremy then gave his briefing of the day’s aims and with ever-hopeful hearts and minds we set to eagerly either deturfing, scraping or cleaning back surfaces. The archaeologists at intervals recorded, measured, photographed and took many samples. 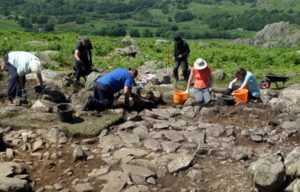 At Tongue House A most of the conversation was about bracken rhizomes and how best to remove them without damaging the archaeology. Competitions ensued to see who could dig up the longest rhizome and the pile of roots grew almost as quickly as the spoil heap. Once the walls of the structure were cleared and exposed it was easier to see the outline of a small building with what looked like a cross- passage or at least a cross wall. Digging down through the surface we came upon a flagged floor of the upper room, with a hearth in one corner and under this floor was another cobbled floor indicating occupation over a long period. However, our hopes that it might be a longhouse were dashed as we found no evidence of a drain hole in the lower room where animals could have been housed. It was more likely a shieling, a temporary summer shelter or residence. Finds were few but some charcoal was discovered along with a piece of metal, and outside the building, a small horseshoe. Tongue House B higher up the fell proved to be a similar shieling but with only one room. Long House Close appeared to be very different from the others. 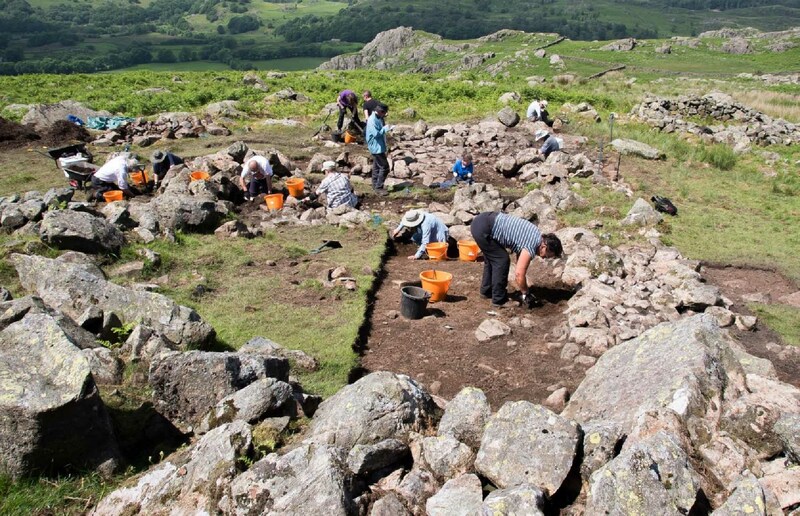 Looking at the site while bracken cutting, there was so much more in the way of surrounding enclosure walls, possibly several structures and other connecting walls snaking over and up the fell. Was this a longhouse or even a settlement? One structure was situated inside another set of walls, the outside walls being more solidly constructed than the inside “building”. This suggested occupation continuing for a long time. We volunteers greeted old friends from the previous years, or made new friends as work got underway. Jeremy daily briefed us with the day’s aims and objectives, and we all settled down in our designated areas. Sometimes all that could be heard was the scrape of the trowel and the buckets filling with rubble. Occasionally our hard work paid off when someone uncovered a find. All heads turned as a piece of pottery, piece of a horseshoe, charcoal or a nail was held up, and at one point when a sizeable piece of pottery was handed to Jeremy he was so excited he nearly danced a jig on the stone he was balancing on. “ Silverdale Ware”, he declared “15th century!” We were thrilled and all set to with renewed vigour. When an artefact was found it was recorded and photographed and bagged up to be taken for analysis and a GPS reading taken of the exact location of the find so that a labelled tag could be placed in the position. As the days went on the trenches were filling up with little white tags. Surely some of these artefacts will provide some dating evidence. 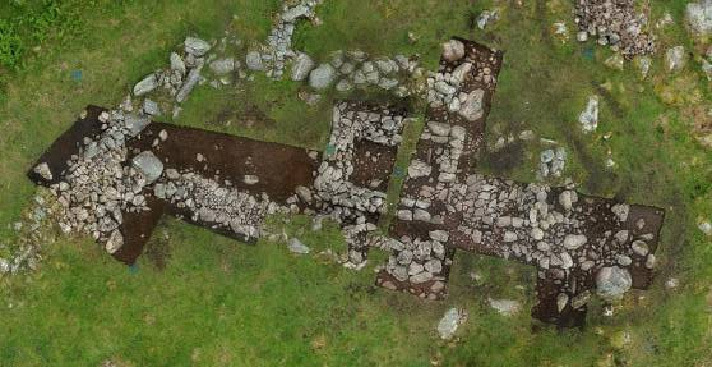 Every so often the site was cleared for Jamie’s drone to be flown over to take aerial photographs. It crossed my mind how much technology had progressed over the three years – from Pete’s camera-on-a-pole to a technical piece of wizardry. Visitors wandered up from the track, including a few uninvited guests like cows, sheep and an indignant meadow pipit trying to feed her young in a hole in one of the walls. Our longhouse soon became much more complicated when digging down below the first floor surface, another floor surface was discovered, and below that a cobbled surface with hearths in each floor. 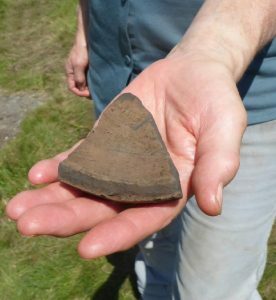 The charcoal in this third hearth was sent off for dating, and far from being medieval or Norse the date came back as a puzzling Bronze Age, 1300 BC. What was going on? 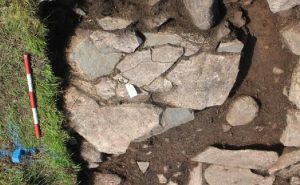 All kinds of theories produced all kinds of discussion – had there been Bronze Age settlement here, was it a ring cairn like the many found around Seathwaite Tarn? Whichever it was originally, settlers thousands of years later used the cobbled surface for their floor. 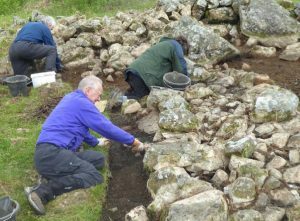 The archaeologists then looked for any evidence of curved walls. The southern wall was a possibility but when we all stood on all the largest stones around the walls nothing led us to believe there had been a circular structure. We have left the archaeologists to their discussions. They are all agreed that this structure also was a shieling, but with much more extension, possibly becoming a longhouse over time, or starting out as a longhouse and finally ending as a shieling. It has been an enthralling three years. 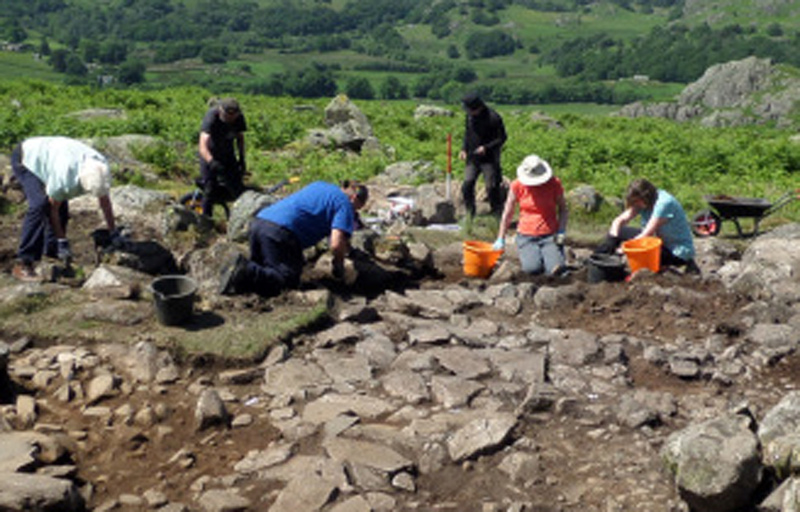 We amateur archaeologists have made new friends, learned new skills and new words – “spit” – a shallow layer. Well I never! Through rain, sun and hot, hot, hot, we have toiled with aching backs and knees and loved every minute of it, even the bracken. The setting of a beautiful valley in gorgeous sunshine set a perfect scene of activity in tranquillity. We will leave it now to the cows and the sheep, to settle back to its original peace with happy memories. 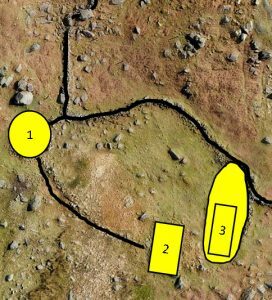 So it’s off up the Seathwaite Dam track again only, this time, we are turning right after the portaloo to arrive at the new site - Longhouse Close – marked on the OS map at SD245973. There, on a flattish piece of land by Duddon Valley standards, there are a number of walls and structures visible now where we have cleared the bracken. A stone wall encircles the site, with a roundish pound, an old rectangular structure with a later square pen on top and another rectangular building closely enclosed in an oval wall. 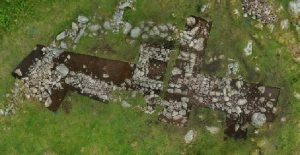 Our original plan had been to investigate the two rectangular structures which we hoped would prove to be early medieval buildings. 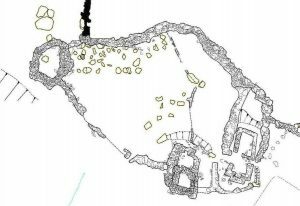 Our plans changed after a visit from David Johnson, from Oxford University, who suggested the oval wall was, in fact, an early, large communal longhouse with a later building inside sharing the same cross passage. He was aware of similar configurations in his studies in the Orkneys. This was now to be the focus of our excavation. The large structure is approximately 24 X 10 metres with a fall from east to west of nearly 4 metres. The northern wall was exposed and shows two revetted faces with rubble infill. The southern wall was not exposed but looks to be made of large boulders. If it had been built in a single phase, you would not expect this difference and it will need investigation next year. 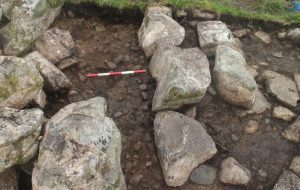 The northern wall is missing at the lower end and it seems likely that the stones have been robbed for later building work. The inner building had a flagged floor with cobbled surfaces underneath. These extended to the outer walls and may go beyond. At one point, the flags were beneath a wall which was interesting but not seen elsewhere. There was a large hearthstone and there were other features which may have been hearths at other levels. 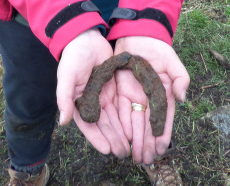 We found a number of horseshoes and two pieces of pottery. One was part of the base of a Silverdale ware pot. As this was found outside the structures it wasn’t able to give a date to a secure context. We covered the excavated areas with terram, replaced the soil and returfed the area planning to look at the upper section and the southern wall in 2018. Then we waited for the results of c-14 dating for some charcoal fragments and a hazel nut. We were hoping for a date to match the early settlement for the Norse settlers coming across the Irish Sea. 900-1000ad would have been very satisfying. 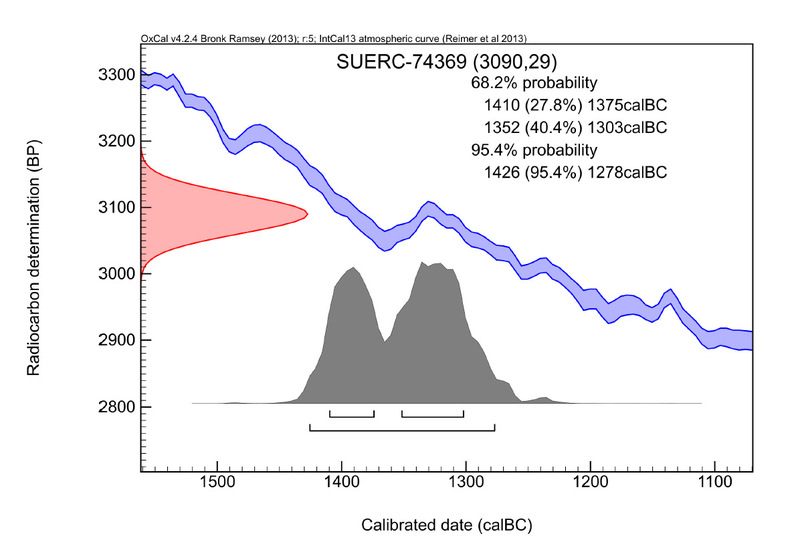 It was with some surprise that we got three very close dates in the Bronze Age! What does this mean? We are not sure but it gives us some very clear questions to try and answer with next year’s dig. 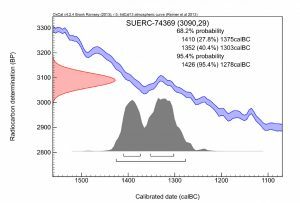 It could be that there was a burning/clearance event in the wider area around the site at that time and, if we dig trial pits outside the boundary, we may find other samples of the same date. It could be that there was a much earlier inhabitation of the site and the charcoal is related to domestic use at the site. We will revisit the areas where the charcoal was found looking now for indications of an earlier phase of occupation.